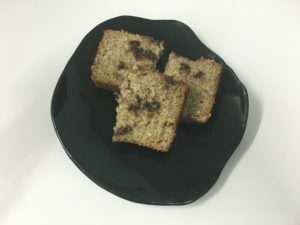 Choc Chip Coconut Banana Bread is a little more wholegrain and lighter on refined sugars than many of the recipes on this site, so you may find it suitable for rides where you want sustained energy release rather than an immediate hit. Most of the sweetness comes from bananas, while texture is provided by brown rice flour and shredded coconut, with further contrast from dark chocolate chips. I chose coconut nectar for flavour, but you could substitute honey if you don’t feel like spending top dollar for exotic versions of sugar. The bananas used do not need to be over-ripe, and you can mash them to a coarser or finer texture depending on your preference. Preheat oven to 180 °C (convection, not fan-forced). In a large bowl, mix together brown rice flour, baking powder, baking soda and salt. Mash bananas by hand or blend in a food processor until smooth. Beat eggs and add to mashed bananas along with coconut oil and coconut nectar then blend again. If your coconut oil has turned solid at room temperature, microwave for a few seconds to liquefy before adding to banana mixture. Pour banana mixture into rice flour mixture. Add shredded coconut and mix through. Pour half the batter into a greased, paper-lined loaf tin (11 x 21 cm base). Mix the dark chocolate chips into the remaining batter, and add the rest of the batter to the tin (this avoids having the choc chips sink to the bottom of the tin and stick). Bake 1 h or until a skewer inserted in the centre of the loaf comes out clean. Let cool 30 min before turning out to slice.